'Healing' is a comparatively easy work, especially in its restricted sense as removal of the symptoms of illness - mostly physical and to an extent mental. But healing as the restoration of wholeness is quite another matter. In order to restore wholeness, the physician should be established in his 'centre'. That is where the bhavana (mental attitude) happens: both the Nimitta bhavana ("I am but an instrument in God's hands") and Narayana bhavana ("I am serving the Lord in all"). Without the right bhavana, work becomes mere labour; with the right bhavana it is transmuted into worship. "Work is worship; dedicate it to God," said Gurudev Sivananda. If you have the right attitude, the Lord Himself places the right remedy in your hands and it works in strict accordance with His Will. 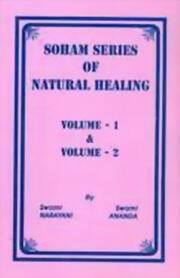 This indeed is the special characteristic and qualification of Sivananda Healing. Bibliographic Information: 387p., Plates; Glossary; Index; 22cm.